get 4 templates in both .psd and .png formats, originally released as may 2012 byoc. Celebrate the beauty of your everyday photos with A Wonderful Day: Mixed Media. Combining office bits and desktop baubles with a vintage color palette, this collection of ephemera is perfect for adding a bit of retro whimsy to a variety of layouts. With everything from fabric flowers and frayed stitches to index cards and word snippets, you'll be prepped to layer to your hearts content, on everything from Project life to Project 365! Be sure to grab the coordinating freebie on my blog! Paper pack contains 8 beautifully patterned papers. Inspired by a friend of mine who is one of the most amazing artists. She uses her talent to share her strong brave heart and positive attitude with the world. This kit celebrates creativity and a love for living with 29 Artsy pieces. 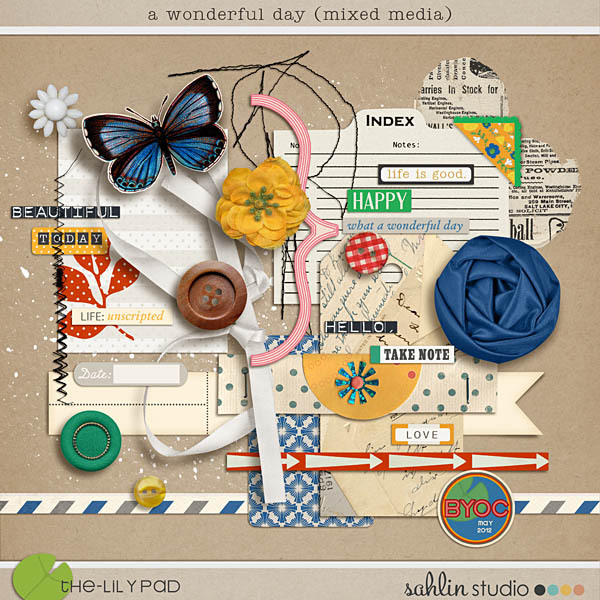 The Dahlia 4x6 templates are designed in the spirit of the every day, of fun, sunshine, summer and play..with simple photo centric compositions that can be used alone or as foundations for your pages, or for creating a cohesive and customized look for your project life pages and project scrapping. Can even be used for creating hybrid cards in your blogging. These templates can be used in either horizontal or vertical orientations to suit your scrapping needs. Includes 20 layered 4x6 templates in .psd and .tiff formats. With shadows that you can easily modify or remove. Also includes color coded layers and layer descriptions and tips for getting the most out of the template designs. I love, love, LOVE art journaling, and I so often find that my half finished expressions make wonderful textured photo mats, story bits, or mini book pages. Enjoy the messy and artful textures, and find these bits to be a great start for your own stories of Life lived with purpose and passion. Everyday, Go Big...Go Get 'em!!! The Petals collection is a colorful, happy, and paper-y collection of 15 different hand-crafted layered paper borders/mats. There are monochromatic, two-toned and multi-colored borders and mats. No two are the same and none are re-colored. Made to coordinate with the happy and fun May 2012 BYOC collection here at The Lilypad but can be used with any variety of product lines and palettes. Use them alone or in combination to dress up your pages and papers, frame photos, or add that extra touch of hand-crafted whimsy to any layout. These crafty colorful borders and mats, and all of my products, are S4H/S4O friendly, and OK for use in Creative Team scrapping. 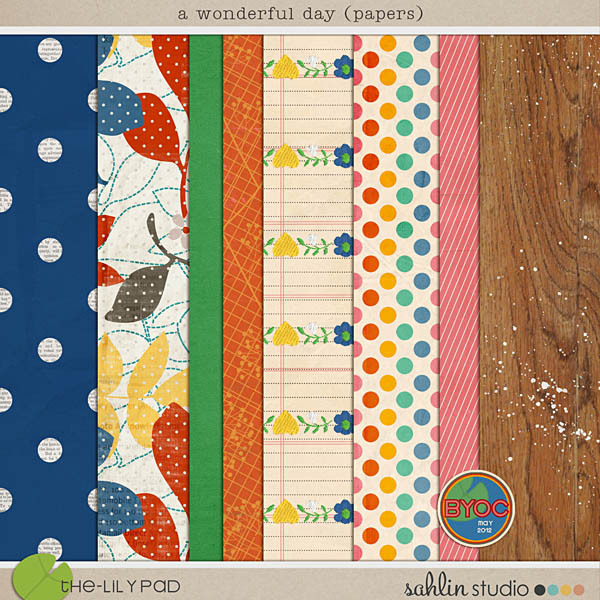 Celebrate the beauty of your everyday photos with A Wonderful Day: Papers. Combining bold, clean patterns with a vintage color palette, these colorful sheets are perfect for adding a bit of whimsy to a variety of layouts. With everything from playful polka dots to grungy florals & pinstripes, you'll never run out of creative inspiration! Sometimes bold can be beautiful...but simple can be classy, and that's definitely the case with my newest alpha set, Typeset Alphas # 1. A three-pack of alpha tabs in soothing neutral tones of white, gray, and black, this set is ideal for pages where a bright and colorful alpha just won't do. Use them alone as monograms, or staple several together to title your favorite art journal page. The look great mixed together, too! 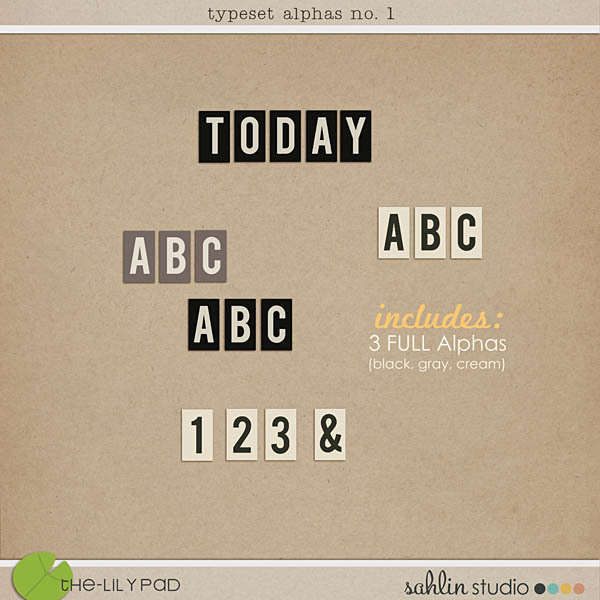 Set includes three full uppercase alphabets with numbers and some punctuation. 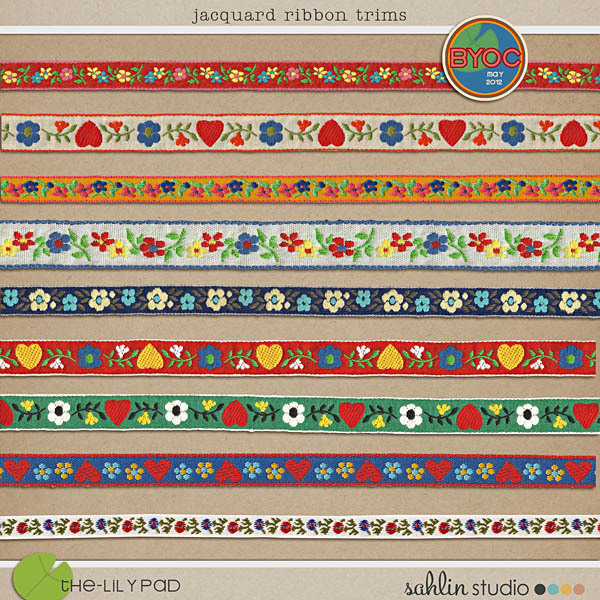 Add a bit of cheery texture to your page with my Jacquard Ribbon Trims! Carefully scanned and extracted, these colorfully embroidered floral ribbons are sure to add an authentic touch to everything from travel pages to Nordic heritage layouts- or anywhere you'd like to bring a bit of charming sweetness to your work! Perfect for creative borders or layering too! Element pack contains 16 unshadowed ribbons. This font was created with a Silver Reed typewriter. All character available were used and shown in preview. a complete .TTF font inspired by the handwriting of Ryan. a complete .TTF font inspired by the handwriting of Vanessa. A collection of hand drawn doodles that are perfect for all the green-fingers gardeners out there! Garden Grown contains the following hand-drawn doodles: bag of compost, 3 flowerpots, small fork, large fork, 'garden' wordart, string, glove, gnome, hat, 2 hoses, 2 plant markers, rake, secateurs, 3 seedlings, 2 packets of seeds, 3 sets of seeds, spade, trowel, garden trug, watering can and water drips, welly boot and wheelbarrow.